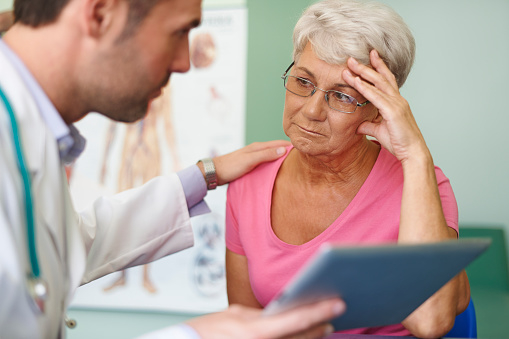 Frontotemporal dementia, also known as Pick’s disease, is an uncommon form of dementia that, while rare overall, is a significant cause of dementia in those under the age of 65. Men and women develop this condition at equal rates, and diagnoses most often happen between ages 45 and 65, although people both above and below this range can be affected. The condition’s name refers to the regions of the brain it affects. The frontal lobes are situated behind the forehead and are mainly associated with behavior, emotional control, and language. The temporal lobes are located on the side of the brain and have numerous functions, several of which are related to how we comprehend words. Frontotemporal dementia occurs when nerve cells in one of these two regions begin to die and the neural pathways change. The altered pathways, dead cells, and loss of key chemical messengers result in the lobe shrinking over time. As with other forms of dementia, like Alzheimer’s, the signs and symptoms can initially be subtle, but will worsen over the years. The cause of this cell death is not entirely known. The current thinking is that the death is caused by abnormal tau protein clumps. There is also a much stronger genetic connection to frontotemporal dementia than Alzheimer’s, with roughly a third of those with frontotemporal dementia having a family history. Loss of inhibition: Behaving in a socially inappropriate, rash, or impulsive manner. Tactless or improper comments are common. Apathy: A loss of interest in other people and/or things, and a general lack of motivation. Dementia-borne apathy is not related to sadness, as it would be in depression. Loss of empathetic capacity: An inability to feel empathy or sympathy results in becoming less responsive to the personal or social needs of others. The result is often appearing cold or selfish. Repetitive or compulsive behaviors: This includes repeatedly employing certain phrases or gestures, hoarding objects, or obsessions, while being exact (i.e. with time). Cravings: Inhibition loss and an alteration in brain chemistry can result in significant cravings or binges of fatty/sweet foods. Difficulty planning: It is common for patients to have trouble organizing, planning, or making decisions. It is important to contrast behavior variant frontotemporal dementia with early-stage Alzheimer’s disease. Where Alzheimer’s patients may struggle with day-to-day memory or judging distances, those with frontotemporal dementia do not experience these specific issues. Even in the initial stages, those with frontotemporal dementia have little control over their behavior and may not even be aware that they have a problem. Symptoms are commonly first noticed by those around the person instead. Hesitant speech: Speaking slowly, stuttering, appearing to have difficulty producing the needed sounds, and mispronouncing words are all common symptoms. Impaired comprehension: Struggling to understand complex or long sentences, but being able to understand single words. Again, another distinction with Alzheimer’s can be drawn here. The memory loss Alzheimer’s causes can lead to patients struggling to recall certain words or names, but in general, the ability to talk comprehensibly or understand others is less severely impaired than in cases of progressive non-fluent aphasia. Also, patients with progressive non-fluent aphasia tend to retain their memory, spatial skills, and organizing and planning ability through the early stages. Questioning familiar words: Asking the meaning of terms commonly taken for granted, such as asking what “spoon” or “bowl” means. Imprecise descriptions and terms: As word association becomes more difficult, generalized words like “food” instead of “apple” are used. Additionally, imprecise descriptions like “the thing that makes things cold” can be used. Association difficulties: Struggling to recognize familiar people or common objects. This is not memory loss, but is instead an inability to connect two pieces of information. Irrelevant speech: The vocabulary difficulties can lead to people with semantic dementia saying sentences that are grammatically correct, but appear to be irrelevant to what is going on. Literacy challenges: Increasing difficulty understanding written words. The retention of memory, spatial, and organization skills shown by patients with progressive non-fluent aphasia is also present in those with semantic dementia. Medical treatments for frontotemporal dementia largely revolve around helping patients cope with symptoms. The condition cannot be cured and its progression is difficult to slow. Antidepressants, antipsychotics, and Alzheimer’s medication can be tried with a doctor’s consultation, but trials have shown them to have mixed results at best. Regular cardiovascular exercise is known to help improve thinking skills. Aromatherapy, music therapy, pet therapy, or other methods of maintaining a calm environment can reduce triggers of problem behaviors. Ginkgo biloba is known to help in Alzheimer’s and vascular dementia by improving memory and vascular blood flow. Although neither of these address frontotemporal dementia’s main symptoms, maintaining a healthy blood flow to the brain is never a bad idea. For those with aphasia or semantic dementia, developing a nonverbal means of communication, like drawing, picture cards, or gestures, can help maintain communication. Speech therapy cannot recover lost communication abilities, but a speech therapist can assist in finding new ones. “Frontotemporal Dementia,” USCF Memory and Aging Center web site; http://memory.ucsf.edu/ftd/livingwithftd/treatments, last accessed September 14, 2015. “Frontotemporal Dementia – Lifestyle and Home Remedies,” Mayo Clinic web site, August 5, 2014; http://www.mayoclinic.org/diseases-conditions/frontotemporal-dementia/basics/lifestyle-home-remedies/con-20023876. “What is frontotemporal dementia?” Alzheimer’s Society web site; http://www.alzheimers.org.uk/site/scripts/documents_info.php?documentID=167, last accessed September 14, 2015.